Premier Guitar has a killer contest going on right now. 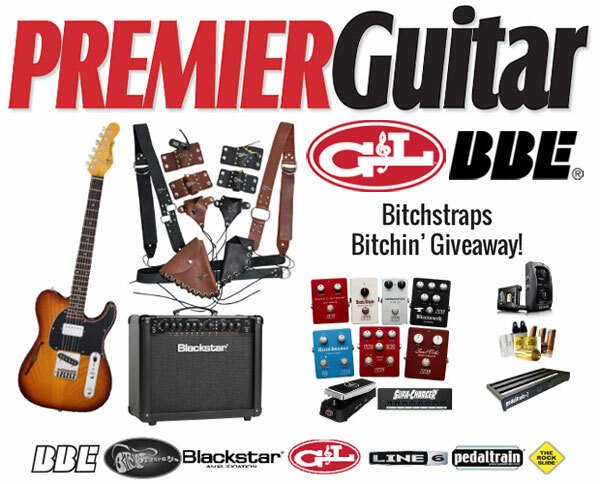 Enter the "Bitchstraps Bitchin' Giveaway" and you might win a great rig that includes a G&L Tribute Series ASAT® Classic Bluesboy™ Semi-Hollow and a bundle of BBE stomp boxes including: a Boosta Grande™, Windowpane™, Blacksmith™, Mind Bender™, Soul Vibe™, Two Timer™, Ben Wah™, and a Sonic Stomp™. They've even thrown in a Supa-Charger™ to power them all. Don't miss out on this great giveaway. And don't delay! Enter by February 17, 2014 for your chance to win. Details are at www.PremierGuitar.com.